In Political Science you deal with the theoretical and practical aspects of politics. 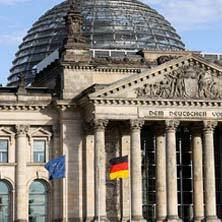 You acquire knowledge of theoretical fundamental questions in politics considered against their historical ideological background, the political system in Germany, other international systems of government and international relations. You will find answers to these questions: Who are the decision-makers in politics? What are their agendas and strategies? Why are some political systems more stable than others? How does the European Union work? How can war and peace be explained with regard to relations between states? Which political ideas have formed over time and how do they affect politics? FAU is one of the few universities in Germany where you can study political science with public law as the second subject. You can also choose modules from the Chair of Human Rights. At our Institute, we have experts in the politics in the Middle East and Far East. The degree programme does not train you to be a politician. You are not automatically qualified to work in journalism. Languages are important in political science – you have to have very good English language proficiency (UNIcert II according to the European Framework of Reference for Languages B2). Other language skills will be a huge advantage. For your future career, it is important that you already start to obtain specialist qualifications (placements, language qualifications, key qualifications) in the Bachelor's degree programme.